The forest is filled with all sorts of Monsters. They watched and waited as you built your Castle and trained your soldiers, but now they’ve gathered their army and are marching out of the woods. Can you work with your friends to defend your Castle against the horde, or will the Monsters tear down your Walls and destroy the precious Castle Towers? You will all win or lose together, but in the end only one player will be declared the Master Slayer! Castle Panic is a cooperative, light strategy game for 1 to 6 players ages 10 and up. Players must work together to defend their castle, in the center of the board, from monsters that attack out of the forest, at the edges of the board. Players trade cards, hit and slay monsters, and plan strategies together to keep their castle to.. The story of the castle is enhanced by the addition of the Dark Titan himself: Agranok. An unparalleled threat, Agranok has returned from banishment with a vengeance, and he's bringing new enemies that will test players like never before. 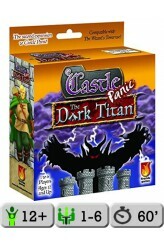 The Dark Titan, an expansion for Castle Panic, adds more powerful enemies to the game, as well as new reinforcements and weapons with which the players can defend the castle. The Dark Titan Agranok is a new 8-point monster seeking vengeance, and his support includes the Dark Sorceress, elite monsters, and a boom troll. To defend against these new threats, players will have a Cavalier that fights for them on the board as well as boiling oil and support tokens. The Dark Titan is compatible with The Wizard’s T.. The Wizard's Tower is an expansion to the board game Castle Panic. 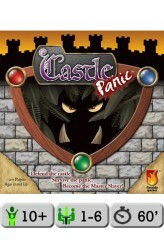 It is not a stand-alone game and requires Castle Panic to play. 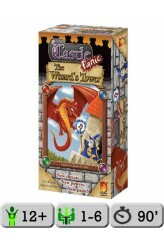 The Wizard's Tower is a cooperative board game for 1 to 6 players ages 12 and up. Your Castle has been rebuilt, and a friendly Wizard has joined your forces. As long as his Tower stands, you and your friends have access to powerful magic spells. And you'll need them, for the Monsters have returned stronger, faster, smarter, and with new abilities to threaten the Castle. You'll fight against magical Imps, evasive flying creatures, and more. Make your stand against six new, dangerous Mega Boss Monsters, including the Dragon and Necromancer. Use fire to attack the Monsters, but beware, your Walls and Towers can be burned do..